Many Melburnians escape winter by flying north, desiring sun and sandy beaches on their too-short escapes from our traditionally cold and wet weather at this time of year. 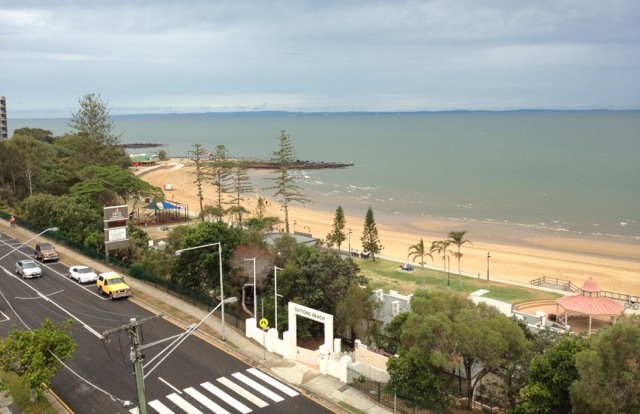 Redcliffe, actually – just north of Brisbane. The best I could lay my hands on right now, but you get the point. We travelled south for a holiday of fire and ice. 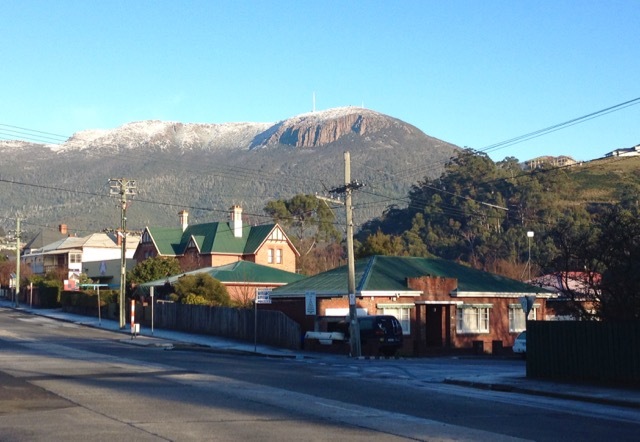 To contrast our summer holiday in Hobart, we thought we’d return to experience winter. Happily, our holiday almost perfectly coincided with this year’s Dark Mofo celebrations (we arrived the day after they started), so we were once again out on the streets with many Hobartians enjoying the festival atmosphere – just somewhat more rugged up now compared to how we’d been dressed 5 months prior. Dark Mofo is what you make of it. Feasting? There were five nights of gorging available this year. Entertainment? 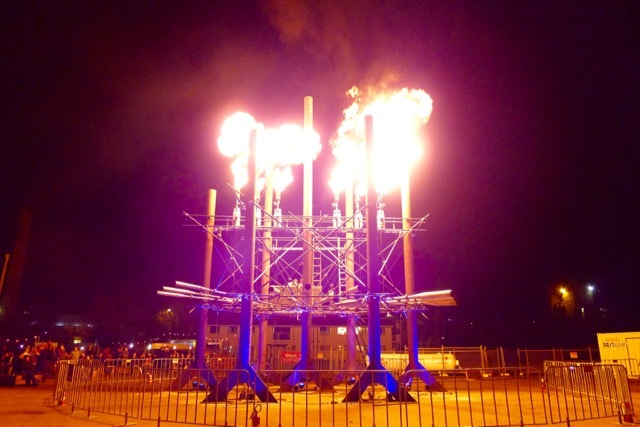 If you were too full to waddle or groan your way over to ‘Dark Park’ (aka Macquarie or “Mac” Point) or participate in the numerous other Dark Mofo events happening around the city, then there were entertainers circulating at the Winter Feast. I’d recognise that head anywhere – it’s mine! But aside from the Dark Mofo events, which were mostly run of an evening – what did we do in Hobart for 10 days? We visited the Cascade Female Factory and learnt what life was like for many women who were sent to (or chose to) come to Hobart. The re-enactment tour called Her Story really brings this period to life, but both this and the pure historical tour are worth doing. Cascade Female Factory is run by the same organisation who runs the Port Arthur Historic Sites. We have been meaning to visit Port Arthur for quite some time, and I can finally now say I’ve been – albeit possibly on the coldest and wettest day of our holiday! I found the ballroom at Hobart City’s Town Hall which is gorgeous, then did a tour of Australia’s oldest theatre, the Theatre Royal on Campbell Street. The ballroom at Hobart City’s Town Hall is just stunning! 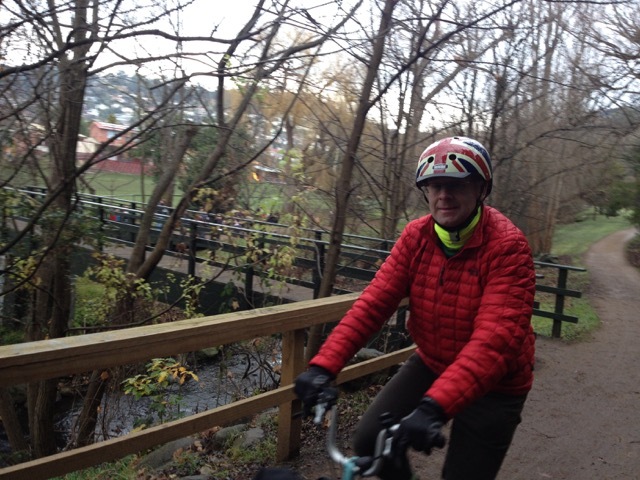 Having taken our Bromptons on holiday with us we were keen to explore Hobart’s bike paths – and found we were staying right next to the Hobart Rivulet track; a very convenient and safe way to either walk or ride into town from South Hobart – better than braving either Macquarie or Davey Streets as a cyclist! 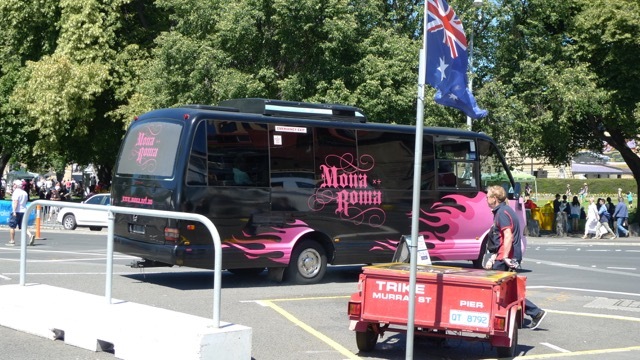 Although we had visited MONA on our summer holiday we wanted to visit again. Our first attempt ended with having lunch across the road and a ride home in the rain as we hadn’t checked ahead and only found out on arrival that MONA is closed of a Tuesday! 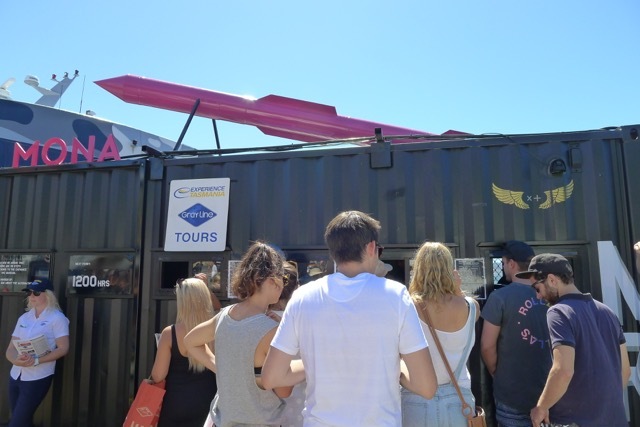 Our second attempt was much more successful – and worth the re-visit for the new exhibits and permanent features we missed last time. The Chamber of Silence – Instructions for the Public. Wear Earmuffs. Be Still. Be silent. Tasmanian Museum and Art Gallery (TMAG) was also on the list of places to re-visit as we didn’t finish exploring it in summer. This time, the Central Gallery was lit with red lights in celebration of the winter festival, lending a slight macabre feeling to the space, but it definitely fit in with the tone the that surrounds Dark Mofo. 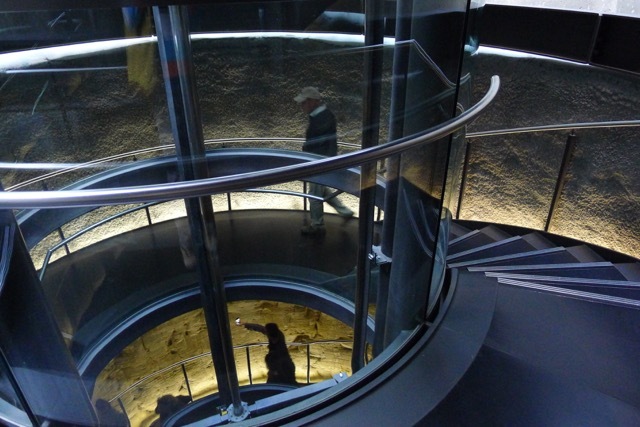 We made sure to explore the Bond Store Galleries – another fantastic old building, brilliantly fitted, maintained and suited for the displays contained. We rode along the Intercity Trail to the Tasmanian Transport Museum in Glenorchy; admired their collection, saw some volunteers hard at work, and discovered a rail line (still in use) in the north-west that we hitherto knew nothing about. 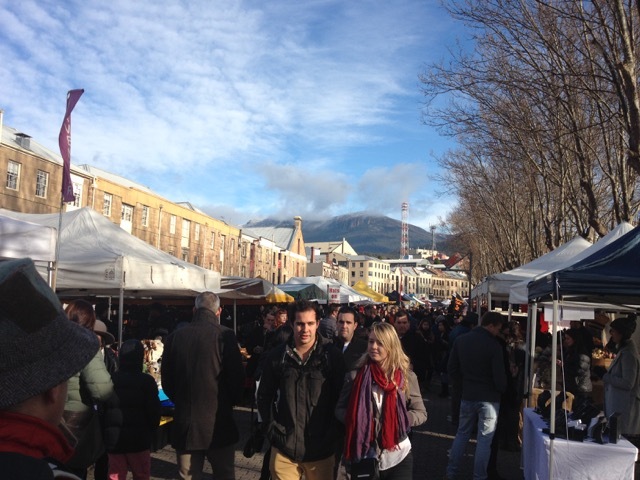 Exploring the Salamanca Market is always on the cards when we’re in Hobart of a Saturday morning. On this trip we both wanted to buy more Mongrel Socks, but we picked up a range of things from a number of stalls; from apple liqueur to fresh passion fruit, fudge, a hand-crafted silver thistle broach for my floppy breton (cap/hat), and Tasmanian-themed screen-printed calico shopping bags. The Farm Gate Market on Bathurst Street in the CBD is open every Sunday morning. If you think that Salamanca is too touristy, then this is probably the market for you. It’s definitely the farmers market to go to for local, fresh produce direct from the grower/maker that you can walk to from your city-based accommodation. We only had time for a day trip to Bruny Island this trip, so it was more in the nature of a scouting mission for next time. Crossing the d’Entrecastaux Channel from Kettering, my hopes of walking up South Bruny Island’s Mt Mangana were dashed when our fears were confirmed – the C Grade roads (maintained by Forestry Tasmania, not the local council) were far too potholed for our Mini to traverse. I don’t think even rental cars ventured much further than we did – and that’s saying something! So, like everyone else, we had to be continent with a walk up the big sand dune at the northern end of the isthmus which connects the two islands, as well as a couple of short walks on some gorgeous beaches around Adventure Bay. Adventure Bay sure looks perfect for a family holiday! The Huon Valley is renown for good food and bountiful harvests of apples! The Apple Shed at Grove is a scenic drive from Hobart. The museum cleverly tells the story of the family who now produce Willie Smiths Cider – indulging in a delicious treat at the cafe while you’re there is highly recommended. The ‘new’ Lake Pedder was on my list of places that I wanted to see, and towards the end of our trip we thought we’d drive out there. Since Mt Field National Park is on the way, we thought we’d stop for lunch and stretch our legs on the short walk to Russell Falls. If you like fungi, this really is the place for you! Mt Field really is a mycological hotspot. (I’ll come back and name them properly.) Oh, and the falls were lovely, too. Strathgordon is the township on the shores of Lake Pedder; it’s the last settlement on the road – 84 km of well-made, winding road along from the Mt Field NP visitor centre. Stephen had fun driving; I was amazed by the view out the window. The very end of the road is the Gordon Dam where you can park and climb down to walk along the top of the dam wall. When you’re done taking photos and playing with echos, it’s another 184km back to Hobart. So that’s what we did. As for what we ate? Well! Ashbolt Farm’s Gluhwein and heirloom fruit crumble were both fantastic, and I love Lost Pippin Cider! Ethos Eat Drink – we’ve finally arrived! BarCelona was a stroke of good luck. We were hoping to eat at Smolt, but the wait staff seemed disinterested (on a Monday night we thought it’d be the opposite) so we tried the restaurant opposite to them in Salamanca Square. It’s a funky bar/restaurant with great lighting highlighting the sandstone walls of the old building. A warm fire (and adequate overhead heating) matched the warm welcome we received from the waitstaff. We weren’t overly hungry that night so we shared a tasting plate of (locally sourced produce) but succumbed to temptation and had a desert each. It was just perfect. Le Provincal is a French restaurant one block away from where were staying on Macquarie Street in south Hobart. In summer we never saw it open (because they were on holidays) so we were intrigued. Turns out it’s a very well-known restaurant and it pays to make a reservation more than one day in advance! The dishes are expertly prepared and delicious which you expect from the reviews. It’s the murals on the walls that I was most entranced by! Extraordinarily well done, if we hadn’t been dining in winter and at night I would have believed that we were actually in a farm cottage in France in late summer! Beautiful ambiance and fantastically authentic food. Does finding a table for breakfast at 9:30am on a weekday morning in a South Hobart cafe sound tricky to you? 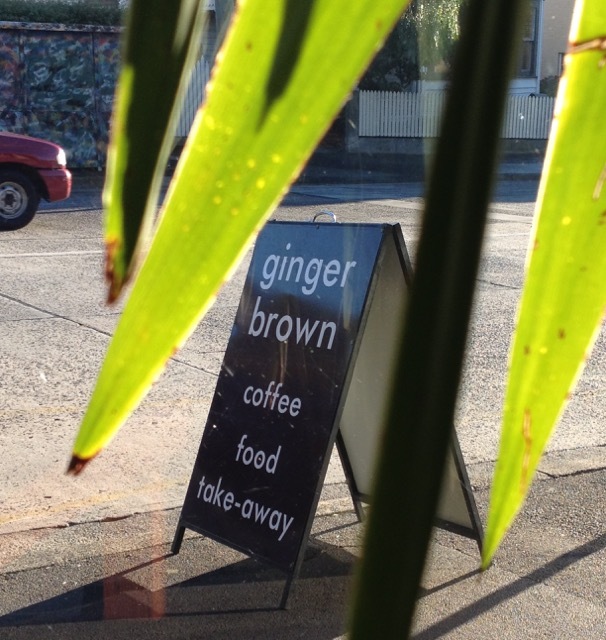 We didn’t think so, but then we didn’t realise until we arrived at Ginger Brown that it is The place to go for brekkie in South Hobart. (Even so, you can still reserve a table! That’s unheard of in Melbourne!) So why is it so popular? Could it be because of the delightfully plump, giant marshmallow they serve with each hot chocolate? Surely it’s not for the jaffa accompanying your cappacino. No, my guess is that it’s the creative way they construct breakfasts. My house-baked crumpets were light and fluffy, Stephen’s crumble was equally delicious. We went twice (both times lucky just to get a seat in the window and not out on the cold footpath) and were impressed on both occasions. Naturally we couldn’t pass up at least one brekkie at Jackman & McRoss at Battery Point. It was a cold morning when we rode in on our Bromptons, but there was enough room behind Stephen’s chair to put both and have them out of the way. The rooms aren’t crammed full of tables and chairs as you’d expect to find in a Melbourne cafe. On the other hand, you may need to wait to be seated. Since Jackman & McRoss are a proper bakery, their huge selection of baked goods to purchase and take away are all mouth-wateringly tempting – even after a filling breakfast! Our accommodation this trip was once again Fireman’s Loft in South Hobart. The location is perfect, especially if – like us – you’re planning to use your accommodation as a ‘base camp’ and go exploring each day; the carpark isn’t a long walk from your room, you don’t have to tackle the city traffic and there are so many conveniences nearby like Hill Street Grocer, The Lost Sock (Laundrette), chemist, newsagent, postoffice, bakery, cycle shop – it’s a great little village along Macquarie Street. On this trip we also discovered the Hobart Rivulet Track into the city was just a stone’s throw away from the Loft. The Hobart Rivulet Track is a shared path that connects Collins Street in the city with the Cascade Brewery. It’s the easiest and most pleasant (and sometimes coldest) route into and out of the city, and the safest route for cyclists. Although it is a dirt path that can freeze in winter, I still feel it’s better than mixing it with the traffic on either Macquarie or Davey Streets – it’s a much easier gradient, too. You can book to stay at Fireman’s Loft (upstairs) or Flourish (downstairs) through either Stayz or Airbnb, but why not contact Tracey directly via the Facebook links? 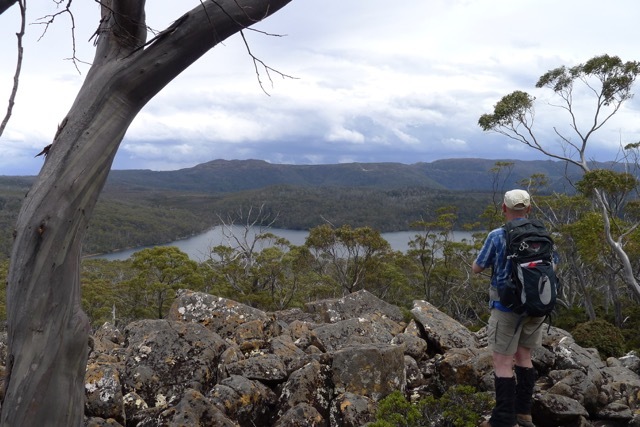 I aim to (eventually) write separate posts about each of the places we visited – as well as update my Tasmania pages – as we have plenty of photos and enjoy sharing our love of Tasmania. It’s a wonderful state to explore. Categories: Holiday, Tasmania | Tags: Adventure Bay, BarCelona, Bruny Island, Cascade Female Factory, Dark Mofo, Dark Park, Ethos Eat Drink, Farm Gate Market, Fireman's Loft, fungi, Ginger Brown, Gordon Dam, Hobart, Hobart Rivulet Tail, holiday, Jackman & McRoss, Le Provencal, MONA, Mt Field National Park, Port Arthur, Russell Falls, Salamanca Market, Solid Light Works, Tasmania, The Apple Shed, Theatre Royal, Transport Museum, Willie Smiths Cider, Winter Festival | Permalink.